Is your black trim looking dull and tired? Here is the best way to have good looking trim, come rain or shine! The Black Shine Trim Restorer from Griot’s Garage will keep its promise to keep your car looking fantastic. My test of the Black Shine Trim Restorer did exactly what Griot’s claims. It does it all: it restores and maintains hard plastic, rubber and vinyl bumpers and trim pieces with a special formula that locks in polymers. It brings back that OEM finish and stands up to rain and thorough washes. This product works on any color of trim and its long-lasting quality means less applications and maintenance is needed. Which means I have more time to enjoy driving! This product includes a convenient applicator pad for a controlled, precise application and mess-free use. Show your attention to detail, get this item in your car’s garage and make your trim look good as new! 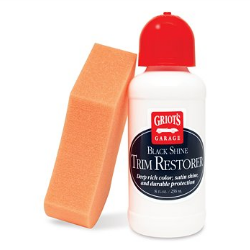 Get Griot’s Garage Black Shine Trim Restorer here for just $14.99. A great investment for the details around your car!